Team USA is on track for a badminton doubles sweep as Phillip Chew and Sattawat Pongnairat took their first ever continental title and Paula Lynn Obanana joined Eva Lee as a Pan Am Games gold medallist. From the outset, it was clear that the men’s doubles badminton event at the 2015 Toronto Pan Am games would be unique. Not only was it the only discipline without a 2011 gold medallist returning but only one player in the draw had ever won any continental title. The United States had claimed gold in Guadalajara four years ago with 2005 World Champions Bach and Gunawan doing the honours. 2009 Pan Am Champion Rodolfo Ramirez of Guatemala was back but he was beaten in his first match by eventual silver medallists Hugo Arthuso and Daniel Paiola of Brazil. Ever since the last Pan Am Games, the continental title has belonged to Canadians Ng and Liu but in their absence, Phillip Chew and Sattawat Pongnairat (pictured) were the clear favourites. They settled for silver in the Atos Markham Pan Am / Parapan Am Centre last year, as had Pongnairat in Guadalajara, and were not about to let the ‘golden’ opportunity slip this time. The northern pair stamped their authority on the match early, with a 7-point run that put them ahead to stay. The lead changed hands more often in the second but the United States team finished strong to take the match 21-18, 21-16. Phillip Chew may just be getting started. He and women’s singles bronze medallist Jamie Subandhi have a date in the mixed doubles gold medal match on Thursday. 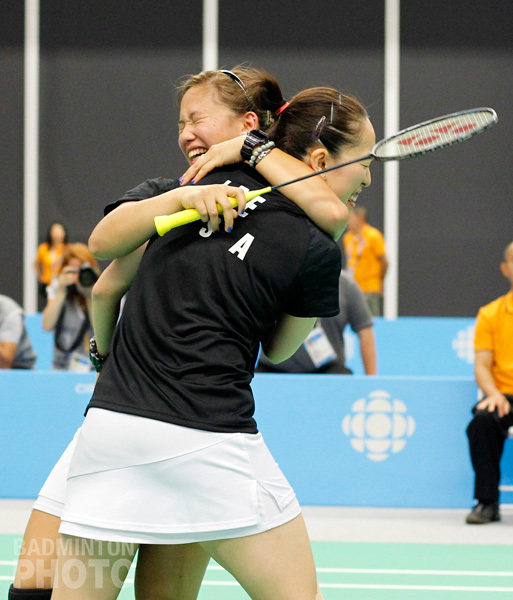 In this event, too, Chew won silver at last year’s Pan Am Championships but unlike in the men’s event, his mixed doubles opponents will be the pair that won the continental title in 2014. The situation was very different in the women’s doubles. Not only were top seeds Eva Lee and Paula Obanana (pictured) the two-time defending continental champions but Lee in particular has a golden history. She took three of the same colour in 2007 before being denied in both doubles finals four years later. This year, she lost early in mixed but she played to her strengths in her quest for women’s doubles gold in Canada. Lee and Obanana gave no quarter to Brazil’s Vicente sisters. They had none of the jitters that saw them barely scrape by in the first game in last year’s Pan Am Championship final and instead, for the third straight time in this tournament, the U.S. pair kept their opponents in single digits in one game. 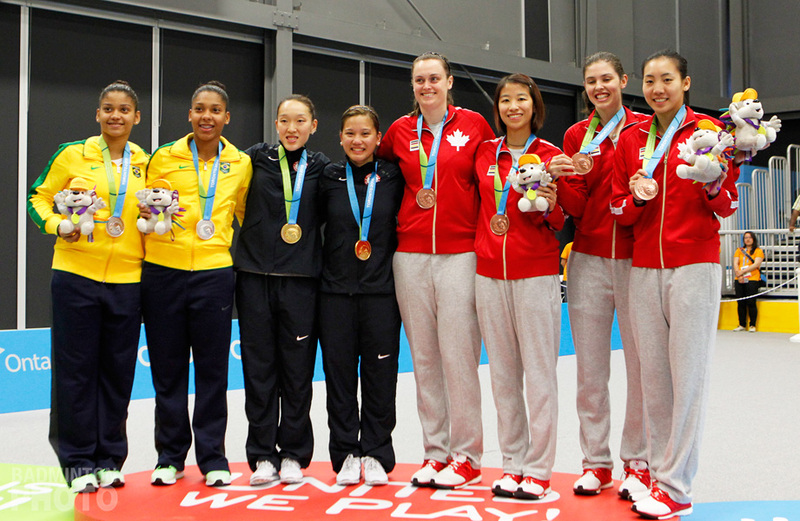 The women’s doubles was the first of three gold medal matches that had a dress rehearsal a year ago in Markham. If Chew and Subandhi can change their stars in the mixed final, then we could be looking at a doubles sweep for the United States but Alex Bruce and Toby Ng are clearly hungry to take Pan Am Games gold at home.